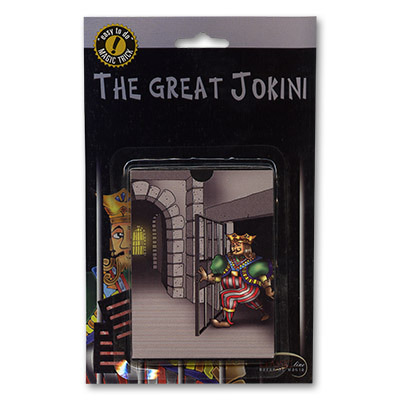 Tell the audience that The Great Jokini, renowned escapist, was once sent to jail for dressing up as the King. Maybe the sentence was too high for something that was supposed to be just a joke. At this point put the joker into the jail and show both sides of the jail to clearly display that the joker is inside. Now put the jail into the case. Tell the audience that The Great Jokini was very sad for having made such a silly joke that sent him to prison. But, alas, he was an escapist and had a great idea. Take the jail out of the box. Everybody will see the Joker in the jail. The joker will vanish instantly and in full view! Show the jail from both sides and ask a spectator to look into the box. She will find the Joker inside. Tell them that The Great Jokini went back to the palace to apologize to His Majesty for his silly joke. The King, being a kind soul, forgave him and everybody in court rejoiced and applauded merrily. Made with Bicycle Regular playing cards.